A farmers' market in Prague. 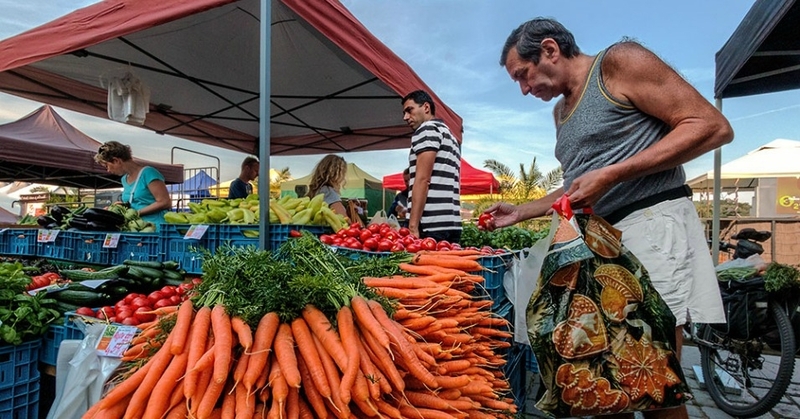 The power of food systems is concentrated in few hands, and this narrow control over seeds, food production, and processing creates a disconnect between consumers and their food with repercussions for maintaining cultural knowledge and skills, local connections, and local economies as well, Friends of the Earth Europe states. But in places across Europe, communities are coming together to show that another way—a better way—is possible. In northern Spain is the Avicultura Campesina, which supports the environment and local economy through its agroecological chicken cooperative. It supports food sovereignty, with three farmers who control the process for raising and processing the chickens in addition to its 31-member cooperative to get the organic chickens to consumers. In Italy are purchasing groups called Gruppi di Acquisto Solidale (GAS) which make their choices based on producers' sustainability and help to "re-establish a direct relationship between the consumer and the farmer." The report states: "GAS groups want to contribute to creating a society in which people can find the time to meet and establish relationships with others. As a result, a number of groups are involved in a range of other activities, such as promoting social economy networks and districts. Through civic engagement, they seek to change production, purchasing, and consumption attitudes and behavior, reaching beyond agriculture and food." France's La Ruche Qui Dit Oui (French for 'the beehive that says yes') is a web platform for "beehives" of food producers and consumers. The platform allows the small number of producers and dozens of consumers within each beehive to coordinate orders and deliveries with cost savings. "The project contributes to the defense of sustainable agriculture, which puts the food at the center of our concerns. It is part of an emerging ecosystem of neighboring initiatives that complement each other and move in the same direction," states Jérémi Anxionnaz from the Ruche. "So together these values can have a strong political and economic dimension and begin to influence the system at a European level." The farmers' markets in the Czech Republic's capital of Prague are providing an example of this alternative paradigm as well. Jana Spilkovà, an Assistant Professor of Social Geography and Regional Development at Prague’s Charles University, called them "the first real example of alternative food networks... in the Czech Republic. They illustrate the start of a noticeably new consumer and producer culture, created as concerns about food consumption, ethics, social diversity, and urban renewal come together." Civil society in Hungary has actively promoted local food, fostering a rise in farmers' markets as well as food festivals, allowing consumers to have "have healthier diets, and increasingly choose local ingredients." The report adds: "The government’s food strategy identified local food systems as being a primary tool of local economic development." Matthew Hayes, member of Open Garden Foundation and researcher at Szent István University in Budapest, states in the report: "As an organic market garden, concentrating on small-scale production for local markets, the ecological footprint of our food is small, whilst the quality is very high, and the environmental and social benefits are great." The report states that "the examples collected here should inspire policymakers to recognize the multiple benefits of short food supply chains for people and the environment. Locally-produced and affordable agroecological food should be the backbone of a food system that increases our food sovereignty. The 'business-as-usual' model can no longer be considered an option for a well-functioning food system in the future." It's not just food systems being reclaimed; a separate report released this month by the Transnational Institute highlighted communities worldwide that are taking back control of their water from private companies, and a recent publication by Grain and La Via Campesina looked at how farmers across the globe have been resisting efforts by governments and corporate agribusiness to limit the practice of practice of saving and exchanging seeds.